Alexander Mikhailovich Zavorotny lives at the station of INTA, near the Arctic circle. In the field of technical creativity, he is no newcomer. He has several original designs snowmobiles and motonarty that he is constantly improving. Design A. Zavorotnaja Intinets original in that the Foundation motoart — frame is made of tubular aluminum elements of the old beds and cots, unnecessary thrown away. This brings to mind the adage is true “is not happiness, but misfortune helped” constructor: frame with all connecting nodes with sufficient strength is only 13 kg! The caterpillar is made from discarded rubber-fabric conveyor belt. It consists of two bands connected by a tubular tracks — negoziazione bolted. Under the head bolts are metal plates that increase the support surface and prevent the breakthrough of the tape. For grip on the phone every third truck welded tapered edge, increasing its height. General belt width 420 mm, and its weight is 32 kg. 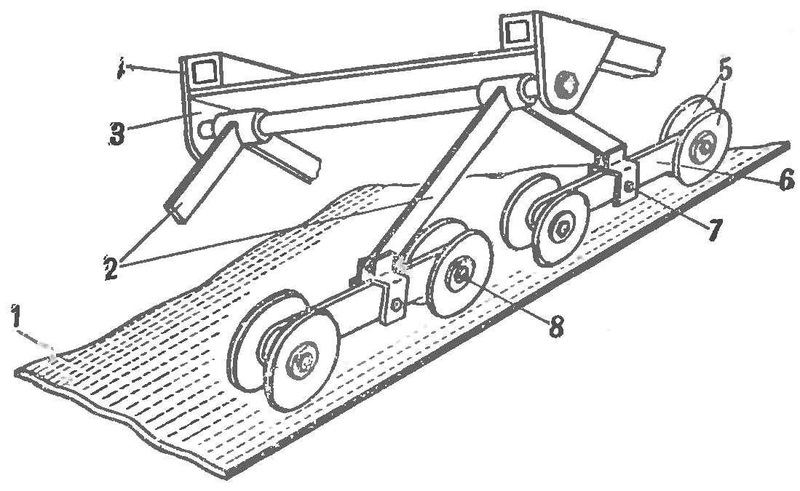 For a uniform distribution of load between driving and idler sprockets track rollers have. They are installed on movable, depreciable coil springs of the carriages, four on each ribbon — total of 8 pieces. For rollers used tires from the wheels of baby strollers, put on cast aluminum wheels. Fig. 1. Motonarty E. Lopushanskogo. Interestingly shaped sprocket track. For lead, a tubular shaft mounted on ball bearings No. 204, Navarin steel flange. On both sides of the flange are the stars: two from the conveyor belt and one having dural. The whole package tighten through bolts. Rubber sprocket is larger than the dural and rubber stands at 3-5 mm. Sprocket has 7 teeth, the depressions between which includes tubular tracks track. This design allows considerably reducing the wear on the sprockets and tracks and reduce noise as the trucks at work are based on the rubber. The transmission from the engine to the drive shaft of the track chain. 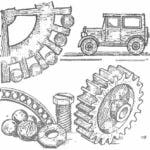 The driven sprocket of the transmission is steel, has 34 teeth and is connected by bolts with the drive shaft of a caterpillar through it welded to a steel flange. On motonartah mounted engine of IZH-56 with the cylinder of the engine from IZH-P with centrifugal fan and guiding shroud for forced cooling of the cylinder. To improve the reliability of the engine and facilitate its start-up at low temperatures on the cylinder are installing two spark plugs operating from one magneto, the second from Maggino, which also provides the current lighting system. Spotlight allows you to use the machine at night. Motonarty countrymen and followers Zavorotnaja A. — S. Korableva, N. Death, E. Lopushanskogo are implemented basically similarly, from the same “bed” part, but have some of the features and improvements of individual components. 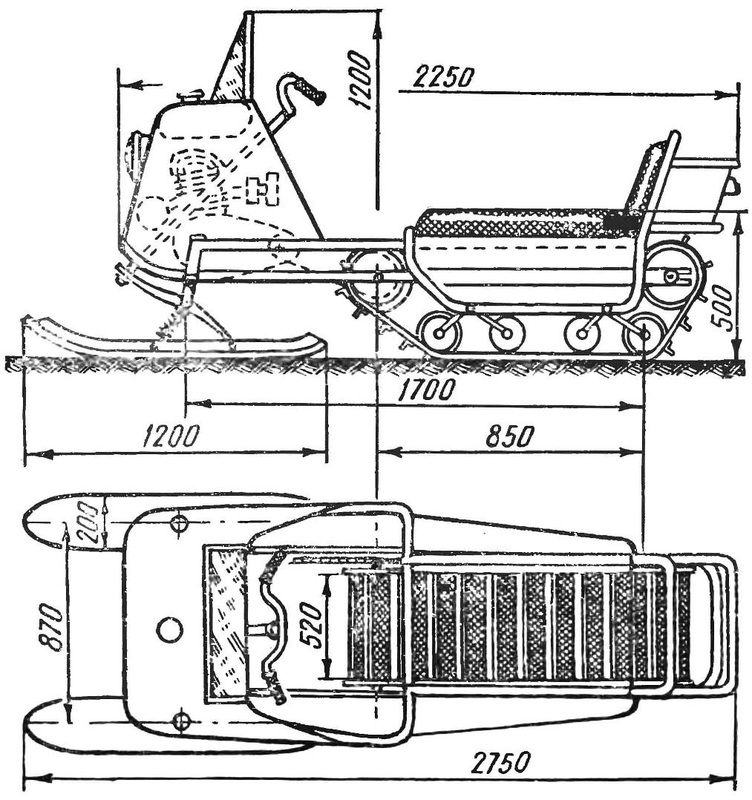 N. Kopkin called your snowmobile “Deer.” Its caterpillar is also made of two conveyor belts with nylon cord, with a width of 120 mm, with a gap between them for the pinion. The ribbon is connected by trucks dural — tube-diameter 22×1, which are pressed onto wooden rods. This, and the large width of the drive sprocket gives the tracks a sufficient bending strength, for some motonartah, mostly with narrow sprockets, aluminum tracks cannot withstand the load, bend. The control unit taken from scooter “Vyatka-150M”, rotating column front steering ski is made of the forks of the bike. Headlight powered by a generator. The motor — scooter “Vyatka”, with a capacity of 6 PS. Motonarty single, but can tow a sled trailer with a total weight of 100-120 kg. the Speed of movement over the snow 25-30, with a trailer and 15 — 20 km/h. Have motoart E. Lopushanskogo frame of steel pipes. They have a soft seat with backrest, behind which formed a small trunk. The back protects the seat from snow during the machine. However, most comfort and led to more weight of machine: 200 kg. 1 — track, 2 — incorrect, 3 — bracket mounted to the housing frame, 4 — frame case, 5 — bottom rollers, 6 — carriage — bolt pivotally securing the cradle to the rocker, 8 — bolt rollers to the carriage. 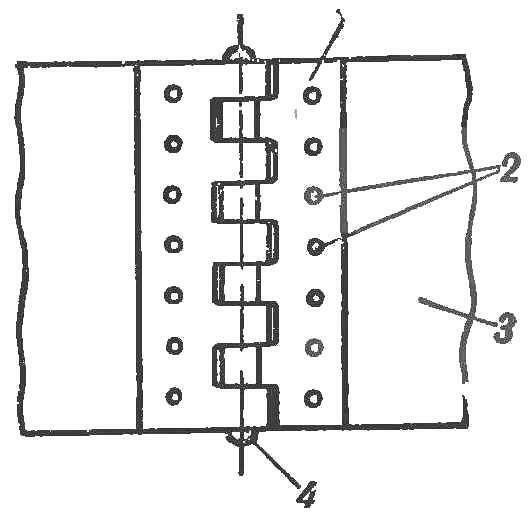 1 — loop, 2 — rivet, 3—, rubber-fabric tape, 4 — hinge. Engine IZH-56, mounted at the front of the frame is also provided with a forced cooling from the centrifugal fan and closed by an easily removable bonnet. Track width — 480 mm. Motonarty can tow a sled trailer weighing up to 200 kg. “Ural” — motonarty S. Korableva, double, engine IZH-P, which is fixed on the frame of steel pipes and is mounted on a hinge. Due to the movable threaded mount the engine can be displaced in height. It also regulates the chain tension and transmitting rotation to the drive shaft of the crawler belt, and this is important because the chain during operation usually stretches and weakens. 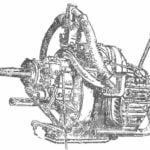 The engine is shifted from the longitudinal axis of the machine to the right during motoart. In parallel with it, on the left is the battery. The battery is from the alternator through a relay-type regulator IZH-1РР. To work in night headlight installed and left on a course, a spotlight-seeker. Thanks to the headroom of the driving gear of the drive of the caterpillar has a larger diameter and 26 teeth. Track — double, with a total width of 500 mm, is also connected there. Originally the front skis. Unlike other designs, the tie rods motoart “Ural” pass over the engine. This protects them from damage. Motonarty “Ural” have a good ride on virgin loose snow, you can take the lifts up to 40°, to tow a trailer weighing up to 230 kg. When tested, they showed a speed over 50 km/h. In the House of pioneers city of Tayga, in the Kemerovo region, is an unusual club, led by the very enthusiastic technical creativity by K. A. Buyanov. Here is a great asset to guys with passion creates a lot of interesting models and machines. Them for a short period of time built two cars hovercraft, snowmobile, motonarty. 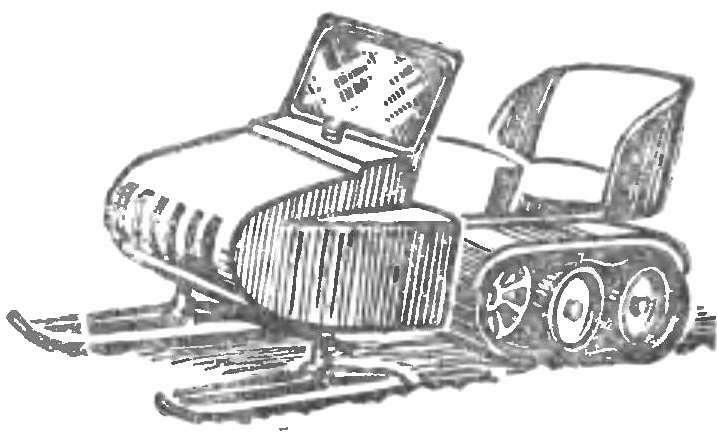 Created by the pioneers motonarty represent double odnopestichnyj a car e two front steering skis. Motoart frame welded from square tubes. The hood covering the engine, wood, easily removable, allows access to all components of the engine installation. To traffic at night motonarty equipped with headlights, stop-signal lamp and turn signal lamp. Lighting powered by the battery. On the dashboard, you can control light battery charging, lights up when the voltage at the terminals of the generator. The engine of the scooter “T-200”, with forced cooling. The transmission from the engine to the drive shaft of the track chain. Originally performed by the undercarriage of the vehicle. Caterpillar from discarded rubber-fabric tape has a width of 400 mm. To the edge of the tape riveted special bent sheet steel hinges. They are joined on a steel hinge. Very well done tension drum tracks. It consists of two steel disks, between which the welded tube on them and falls track. 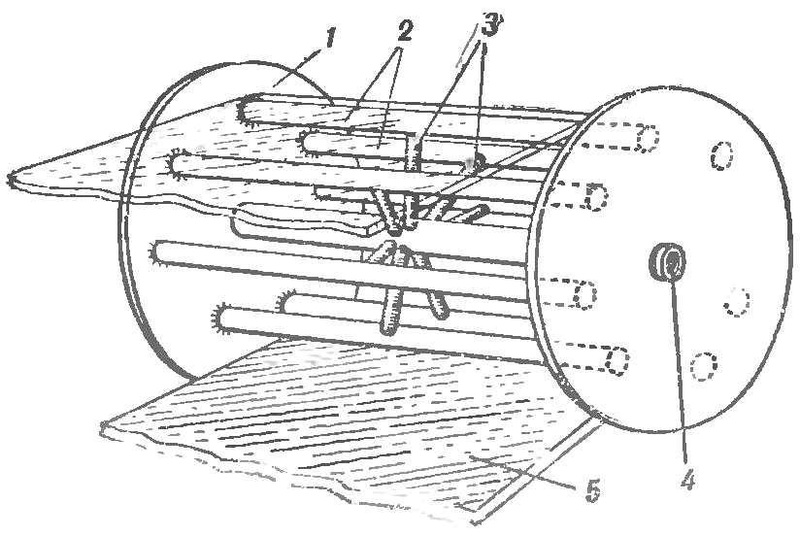 To the tube at great length does not bend, center welded to the spokes, also made of tubes. The drives of the drum and simultaneously serve as stops, preventing the slipping of the tape. This design allows to ensure reliability of track, saves it from clogging with snow, which is a big disadvantage on many machines. As originally made the track rollers of caterpillar. They consist of four beam carriages at the ends of which are placed on two rollers of a small diameter. 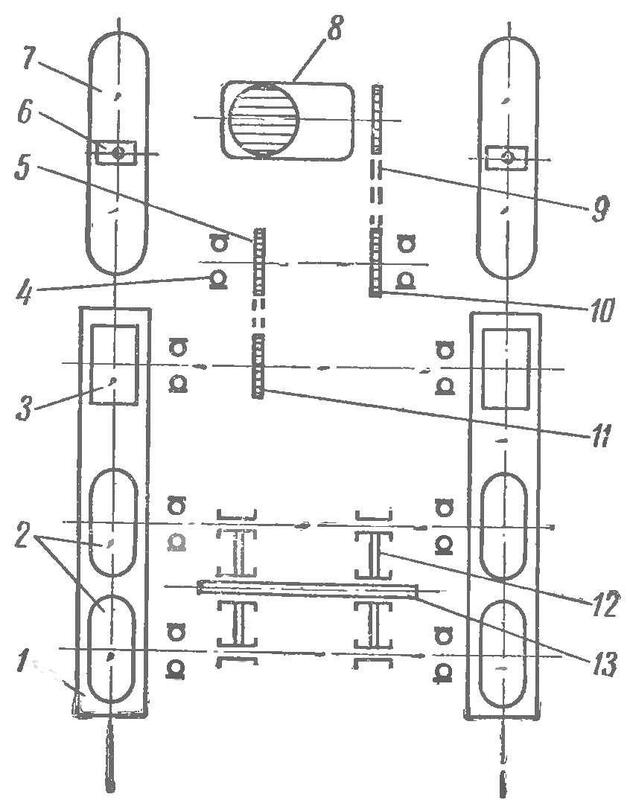 The balance of the carriage, in turn mounted on a movable yoke carrying at each end one carriage. Ski motoart made of aspen boards and metal fittings running the soles. To improve the controllability and stability of speed on the soles wad installed undercuts. Motonarty created by Y. F. Kolodkin of the Kuibyshev region, is a double two track machine with two front steering wads. This scheme is advantageous in that track are moving on the trail, compacted skiing. This provides a more reliable grip tape with a snow crust, reduces soprotivlenie movement, so it does not require power consumption for the laying of track and compaction of snow under the front of the caterpillar. Two track machine has slightly better maneuverability and good stability, especially when driving on slopes, that is with a side roll. But at the same time the presence of two tracks complicates the machine, increases the complexity of manufacture, weight. Fig. 5. General view motoart Yuri Kolodkin. 1 — track, 2 — wheels (scooter), 3 — leading drum tracks, 4 — bearing, 5 — sprocket of the intermediate shaft 6 rotary axis of the ski, 7 — ski 8 — engine, 9 — circuit motor, 10 — sprocket driven intermediate shaft, 11 — sprocket driven drive shaft caterpillars, 12 — carriage of the suspension support wheels, 13 — axis carriage. On motonartah includes a motor scooter of T-200M power 6.5 HP From the engine to the transmission drive shaft track is purposes, via an intermediate shaft. Leading asterisks are made of 12-ply plywood, two on the caterpillar. Their diameter is 400 mm. The steering has an intermediate shaft. The column used from the car “MAZ-205”, it goes over the engine. From her chain, through the sprocket from the children’s Bicycle is driven in rotation by the intermediate shaft. 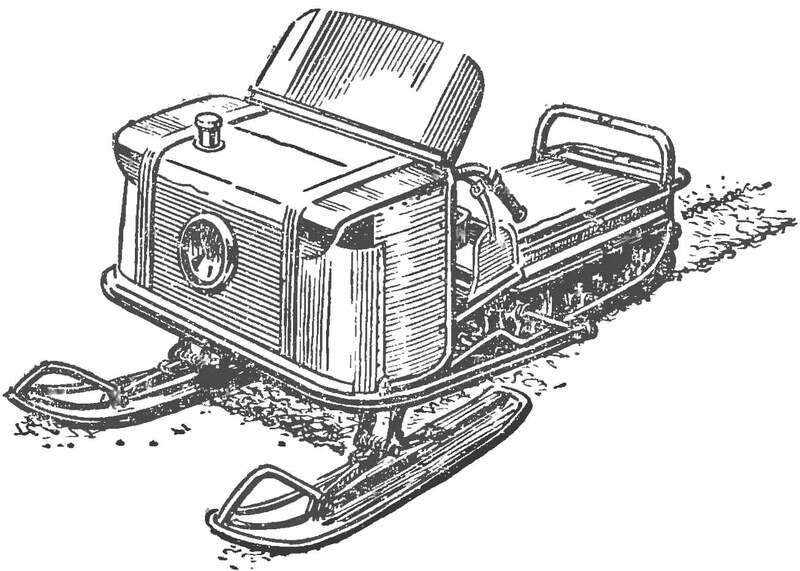 It is attached with a cable that connects to the tiller swivel axis of the ski. The soles of the skis lined with polyethylene. For this we used plastic pipe: its cut along the tape with a width of 30-40 mm. This provides the skis a good glide. The disadvantage of the machine, said Yuri Kolodkin, F., is the low engine power, not allowing to develop on the machine considerable speed.